Most universities receive at least some money from the government. Given this you may want to know what exactly the university gives back to society. Now certain departments, like chemistry, are easy to justify; the research done by the faculty is often of practical value, or leads to something of practical value. Of course it is much harder to justify the film studies department. Actually I myself am at a loss as to how the humanities and art departments in general manage to justify themselves. Now I am not saying that art is without value, art is quite valuable. It’s just that most great art and literature seems to be produced outside the academic system. The academic system seems to produce critics and theorists, and I’m not sure how they are useful. But let’s forget about them, here I am only interested in justifying the philosophy department. Historically philosophy has often been a source of inspiration for endeavors in other fields. Philosophy has prompted new ways of looking at problems. It has also inspired people to challenge the status quo, and to do new and interesting things. But I do not think the inspirational value of philosophy can justify the existence of the philosophy department. Inspiration can come from anywhere; without philosophy people would still be inspired. And the philosophy that tends to be the most inspiring tends to be the worst philosophy. The most inspiring philosophy, that which is most likely to grab the interest of the reader, is that which is written not as a careful argument or analysis, but rather that which is written as more of an opinion piece. Such authors don’t attempt to convince their readers by careful argument, but rather by rhetorical devices. For example, the work of Karl Marx is often classified as political philosophy. And although it has a history of being very inspirational and influential it is bad philosophy. Not because it was wrong, but because the arguments for communism and against capitalism were based on poor reasoning and little evidence. To produce such philosophy is not the goal of the philosophy department. I think that the value of philosophy, and hence of philosophy departments, lies instead in the fact that it is one of the few disciplines that tackles normative questions. Instead of just describing how things are philosophy also tends to describe how things should be. Epistemology for example tells us how we should reason, and ethics tells us how we should act. And the branches of philosophy that don’t make any recommendations by themselves, such as metaphysics, often serve as a foundation for these other investigations. Now I’m not claiming that other disciplines never make recommendations of any kind. Engineering will tell you how strong the steel needs to be if the bridge is to hold, and economics tells you how the federal reserve should alter interest rates to counter inflation. But these questions are only asked and answered within a descriptive framework, for example the answers that economics gives are only valid because we are working within one particular economic system. In contrast philosophy tackles which economic system we should wish to live under and why, a question that cannot be answered from within economics. That at least is how philosophy could be of value. But there is a slight problem, which is that no one seems to read modern philosophy except for other philosophers. Partly this may be because most modern philosophy is published as technical journal articles that aren’t readily accessible to most people. But I think it is also partly because of peoples’ attitudes towards philosophy. Many people treat philosophy as though it were a kind of literature, like an art of ideas. As such they tend to read the philosophy of the “big names”, just as many people focus on reading the works of Shakespeare and Proust. But this means that most people focus on reading the philosophy of the enlightenment (or earlier). This is a bad thing because philosophy is not an art of ideas. Philosophy has progressed beyond the ideas of the enlightenment, or so I should hope. Which is not to say that the enlightenment philosophers were completely wrong, just as the enlightenment scientists (often the same people) weren’t completely wrong. But the ideas of the enlightenment have since been discarded, refined, or improved upon. So a non-philosopher reading enlightenment philosophy is like a non-scientist reading enlightenment science. They may learn something, but they could benefit more by reading more modern material. But just because academic philosophy and the modern reader of philosophy haven’t quite managed to meet doesn’t mean that the philosophy department is useless. Certainly some people read modern philosophy. And more importantly philosophy departments will keep philosophy moving forward, and eventually I suppose that academic philosophy and the modern reader will find a way to reach each other. At that point the work being done in philosophy will once again become of immediate practical value. There is something that strikes me as absurd about utilitarianism. Now certainly the goal of utilitarianism, maximizing happiness, seems reasonable. (Although it too can be questioned. Is happiness really what we desire for society? If so then why not put drugs in the water?) However the idea that we can get a happiness sum by taking the happiness of individuals and adding them up seems less so. First of all it isn’t obvious that the happiness and suffering of different people are comparable in this way. And, more importantly, it seems to ignore important ethical principles, and run into some difficulties by doing so. For example, it would seem to justify theft, so long as the thief benefits more than the person being robbed suffers. But on the other hand it can’t endorse robbery in general, even when the thief benefits more than the victim suffers, because then society would collapse, an outcome that would not maximize happiness. Now there are ways to get around this apparent contradiction (between recommending certain acts of theft while at the same time condemning theft in general), some better than others, but the fact that such contradictions seem to pop up in the first place hints that there is something wrong with utilitarianism. Of course arguing against utilitarianism is hard to do, not because it is a perfect ethical doctrine, but because there are so many variations of it. If you put forth an argument against the two main kinds of utilitarianism (act and rule utilitarianism) some will simply take this as evidence that their personal variant of utilitarianism is the right one, if it avoids that particular pitfall. Of course maybe it is, but maybe it avoids that pitfall only because the objection wasn’t tailored with it in mind. In any case my strategy here will be to argue that any scheme in which the only ultimate goal is to maximize happiness, by whatever means (rules, acts, or whatever), is in some possible worlds anti-normative, meaning that the vast majority of people in such worlds have reason to act against the recommendations of utilitarianism, have no reason to act in accordance with its recommendations, and that the outcome of acting in accordance with its recommendations is worse than deviating from them by any non-utilitarian standard. Now we suppose that ethics is normative, and normative in all possible worlds, because if it isn’t normative in all possible worlds then it is possible it isn’t normative here (and to entertain the idea that ethics is non-normative in some worlds seems absurd by itself). This indicates that even if utilitarianism happens to be normative here it isn’t a complete ethical theory, but rather part of a larger theory that applies to all possible worlds. But if it is part of such a larger theory then we would expect utilitarianism to be at best an incomplete ethical theory by itself, even in this world. Of course you know what my position on ethics is, I think we should act so as to maximize the wellbeing of society as a whole. Such an ethical theory, while consequentialist like utilitarianism, does not reverse its judgments because of the addition of one psychic sadist. In fact I see this doctrine as being a candidate for the more complete ethics that I alluded to earlier, which I said that utilitarianism was but one part of. Generally when everything is working properly, and people are getting along and obeying the rules, then maximizing happiness is what is best for society. However, there are cases in which maximizing happiness may be detrimental to society, such as when we take away the happiness of many people in order to make one person happier. Such actions make society less stable, assuming they don’t have some justification other than increasing the total happiness (a justification acceptable to those who are being made less happy), and hence are actually unethical. Here then we have a kind of compromise. We might actually agree that utilitarian reasoning is a good rule of thumb, and that it might make sense to employ it when reasoning ethically about simple and relatively unimportant matters. However when we want to give a detailed ethical analysis of some situation, or make absolutely sure that we are doing the right thing, then we would appeal to the complete theory. * And it raises the possibility that someone could justify, at least to themselves, any normally unethical act if they believed in the existence of such a psychic sadist. Since people can believe in a benevolent god it seems possible that some people might believe in a hostile god, who enjoys the suffering of the world. Again, it seems absurd that people who are working with the correct theory could justify an inverted set of ethical judgments just because of the addition of one false belief which has no observable consequences. As established previously it isn’t the case that natural laws exist outside of the universe, so to speak, and force events to progress as they do. But it is an undeniable fact that the universe seems to have a regular structure. I wouldn’t want to say that it was structured as if there were such external laws, because the best way to look at the universe in such investigations is as a whole. And by looking at it as a whole we are looking at it at all times, not just some particular moment. So talking about future events being forced by past events is to bring in time to a timeless situation. Rather we should say that the universe looks patterned, that if we look at a particular state of affairs at an arbitrary location in space and time it is always preceded and succeeded by other states of affairs in a predictable and regular manner. It seems legitimate to ask why this regular pattern exists, instead of chaos or random deviations. There are basically two ways to approach this problem. We can either attempt to show that universes without a regular structure are impossible or we can use the anthropic principle, and argue that any conscious observers in any universe should expect to observe a universe that appears patterned. The first approach is perhaps historically more popular. Some have suggested that universes that are simple are more likely to exist, and that regularity is a form of simplicity (why? maybe god likes them better). Others have suggested that a universe is not defined by what happens within it, but rather by its regularities and either its initial or final conditions. But the problem with these ideas is that they are just speculation. The available evidence does not favor one of them over any other, and we have no way to rule out the as yet unthought of possibilities, or the possibility that there is no reason, and that the universe we inhabit just happens to be ordered. Certainly there doesn’t seem anything inherently contradictory in the idea of a universe that doesn’t behave completely regularly, and if there isn’t then it will be impossible to prove that the universe must be regular in this way. Thus an appeal to the anthropic principle seems more likely to provide a satisfactory explanation. Such an appeal results not in an a priori argument for the existence of regularities, but rather an a posteriori one, in which the existence of regularities are deduced in part from the fact that we exist and are conscious. Such an argument admits of the possibility that there are other universes that are unordered, or if there is only one universe, that our universe equally well could have been without any regularities. To get the argument going we must first look more closely at what regularities are and how the universe might fail to exhibit them. We might think that the law of gravitation is an example of just the kind of regularity we are interested in, but in fact it is not. It is true that the law of gravitation expresses a regularity, but it is not a fundamental regularity. A fundamental regularity is one that governs the interactions of the smallest components of the universe. Other regularities, like the law of gravitation, exist because of these fundamental regularities. A change in the fundamental regularities would result in a change in them, and they could not change without there also being some change in the fundamental regularities. One way in which our universe might fail to be regular overall is if the regularities change at different times from one set of regularities to another. Such a change however would obliterate any consciousness in that universe. A change in the ways in which the fundamental components of nature interact would result in a change in the way everything works, since those same components make up everything. And thus the way minds work would change as well. And consciousness is a delicate phenomena, changes in the way the mind works are likely to change whether that mind is conscious. Thus a universe in which there are conscious minds can’t be one in which those minds observe a change in which regularities describe the world, because the occurrence of such a change would obliterate those minds. And so we can reason anthropically and conclude that because we exist our universe is one in which the regularities don’t change. Of course this says nothing about whether the universe will remain regular in the future, but given the fact that it has been regular so far, and the fact that there is no way to falsify the hypothesis that the regularities will change sometime in the future, it is reasonable to think that it will remain regular. Of course it may be that instead of the regularities changing random events happen on occasion that do not fit into the overall pattern of the universe. Now if our universe was a classical universe this might make sense, but our universe is a quantum universe, which means that there is already a small probability that everything that can happen will happen. So to say that an event that breaks the overall pattern occurs is really to say that it has an unusually high probability of occurring, one that doesn’t fit the pattern. But suppose this event actually occurs, what will the inhabitants of this universe think? Well, they will think that they have just witnessed a very improbable event, but not an impossible one. And since improbable events do occur this will not cause them to think that any regularities have been broken. To make them think that this unusual event would have to happen repeatedly, so that the probability of it happening can be observed to be greater than the probability predicted by regularities that are thought to describe the universe. But then they will not be motivated to think that the regularities are being broken, but that there are a different set of regularities in which the probability of that event occurring is higher than they previously thought. So, even if the universe really does contain events that break with every regularity, that fact won’t be known by the inhabitants, who will still conclude that the universe is regular. So no matter what if a universe contains conscious inhabitants then those inhabitants will conclude that the universe they live in is governed by regularities. And since we are inhabitants of a universe this tells us that we should expect the universe to seem regular. And thus there is no need to further need to explain why such regularities are perceived to exist. There is a doctrine that only individuals are subjects or substances. What exactly this means is never perfectly clear, but those who hold it seem to mean that there is something it is to be an individual thing which aggregate things do not have (perhaps haecceity?). For example, some might claim that individual things have essential properties, while collections of things do not. Once upon a time this used to distinguish people and animals from things like table and chairs. But of course we realize now that the bodies of people and animals are as much collections of parts as anything else, so if such a doctrine is held now it must apply only to the fundamental and indivisible constituents of nature, and possibly immaterial minds if you are a dualist. But how could such a doctrine possibly be argued for? Well some say that it follows from logic. Now this seems like the cart pulling the horse, as logic is supposed to describe truth, and thus it would seem impossible to deduce facts from logic, only to deduce logic from facts. However let us examine the argument itself. Those who hold this doctrine claim that to be a subject or a substance is to be the proper object of prediction. Thus since I can have the property of going to the store I could be said to be an object of prediction. And, in addition to this they claim that groups and aggregates are not proper objects of prediction, and that to ascribe some property to a group is really only to say something about each of its members. Thus to say that my body goes to the store is really only to say that each of its parts goes to the store, and thus that the body isn’t a proper object of prediction. Now, to return to my initial point, this is a bad argument, because all it might show is that our logic is flawed, that groups and aggregates really are proper objects of prediction and that there is something wrong with our logic if it prevents us from ascribing properties to them as a whole and not to each of their parts. Properly speaking we must decide by some other means whether groups are proper objects of prediction, and then evaluate our logic in light of that. But fortunately for our logic groups are already proper objects of prediction, if we consider the right predicates. Admittedly some of the time when we make a claim about a group we might only be doing so as a kind of abbreviated way of talking about each of its members individually. But there are predicates that apply only to the group, and which make no sense to apply to individual members. For example, an army can be disbanded, but it doesn’t make any sense to say of an individual soldier that he or she was disbanded, unless we are trying to say that he or she was removed from the army. But to say that he or she was removed from the army is to say that there is a certain relation between him or her and the army, which again makes the army an object of prediction (and isn’t really what we meant to say when we said that the army was disbanded). Or we might say that the army was divided into two equal groups. Although we could try to translate this into a claim about individual soldiers, such as their being placed into group A or group B, it doesn’t capture the full meaning of the group predication, since it says nothing about the relative size of those two groups. Finally, leaving the army behind for a moment, we might wish to say of a collection of particles that their center of mass is at a certain location, but this doesn’t translate at all into a claim about individual particles. Now this is an interesting line of thought in its own right, and I am sure there is plenty more to say about what can be predicated of groups, how it differs from what can be predicated of its members, and the implications of these differences. But to elaborate on those ideas would be to stray too far from the initial topic. So, to return to the initial topic, how does this have an impact on what a substance is? What I think it shows is not that groups have substances, but rather that substance is an empty term. If you define substance as the proper object of predication, as many do, then what substances are depend on how you define predication. Now I have shown here that as we usually understand it we can predicate things of groups. But there is no ultimate fact about what predication is, predication is one of those words that reflects not something about the word, but is defined arbitrarily so as to be useful to us. If it was useful to restrict predication to individuals then we would. Thus substance appears to be equally arbitrary in meaning. Now, like predication, we might say that substance is defined in such a way as to be useful. Certainly that is possible, but philosophers who use the term refuse to use it in that way; they like to make claims about what substances are, and then derive conclusions about the world from the nature of substance. Which is about as methodologically backwards as deriving facts about the world from your logic. * How many things can you meaningfully say of A+B? I think the answer is 14 (24 – 2). I contend that there is no such thing as backwards causation (a future event being the cause of a past event). This is a contentious claim, more so because I hold that even if time travel were possible there would still be no such thing as backwards causation. Of course at first glance it certainly seems like backwards causation is possible. We imagine scenarios in which time travelers go into the past and have some effect there, and reason that if they hadn’t gone into the past then they wouldn’t have had those effects, and thus that their decision to go backwards in time is a cause of those past effects. But I claim that this reasoning does not demonstrate that backwards causation makes sense, rather it demonstrates that our intuitions fail us when it comes to time travel. Let us say that in this case the time travelers had some effect in the past. And now we in the future are contemplating what effects their choosing not to go would have. But this falsely supposes that there are two directions of time. One would be the usual flow of time from past to future and the other would be the direction upon which their decision not to travel in time has an effect on past events (if they make the choice to go one sequence of events happens along this direction of time, which leaves the past as it is, and if they don’t go another sequence of events happens which change the past). However there is only one direction of time, and so the intuitive description is obviously wrong somewhere. But this is just hand waving. Onwards then, to the detailed explanation. There are actually two ways in which backwards causation might seem to occur. One is through “classical” time travel, where an effect propagates backwards in time, and the other is via general relativity, where the time traveler never moves backwards in time locally, but overall follows a path that gets them back to where they started before they left. The relativity case is actually easier to deal with, so I will address it first. The relativity case is easier to deal with because relativity in general makes a mess out of causation. Observers in different frames of reference will disagree about the order of events and thus about causation. So already we must restrict ourselves, and realize that we can only sensibly talk about causation with respect to some frame of reference. In the case of a time-like loop (where someone follows a path that brings them to a time before they started) we want to know what causation looks like to an outside observer (since from the point of view of the observer following the time-like loop it doesn’t seem to them that they have gone back in time, but rather that time in the rest of the universe reversed direction). Let us suppose that they witness a billiard ball arrive at t1, and meet up with an earlier version of itself, which then proceeds to leave on the path that will bring it back to t1 at t2. Here we might actually legitimately say that the billiard ball leaving at t2 was the cause of it arriving at t1. However this is not backwards causation. It is not backwards causation due to how past, future, and simultaneous, are defined in special relativity (in terms of the paths light can take). If such a time-like loop exists then to some observer between t1 and t2 time t1 will simultaneously be in the past and in the future. And thus if the billiard ball leaving at t2 happens to have a causal influence at t1 that is not backwards causation, but rather forwards causation in a very strange space-time geometry. Of course that is very unintuitive, but we have to accept it, since while relativity is an unintuitive theory it is well confirmed by experiment. And besides there are serious doubts as to whether such time-like loops can actually occur. Now we think of B as a particle that appears spontaneously, and along with it appears what we can call its T-anti-particle (which has negative mass and energy if the conservation rules are obeyed). 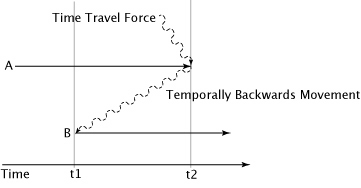 The T-anti-particle follows some trajectory until it encounters a particles of the same type as B, A, and at the same time it collides with A it is also struck by a T-force. As a result of this interaction A and the T-anti-particle disappear. What happens in this scenario if something changes at t2 (for example if the T-force isn’t present)? 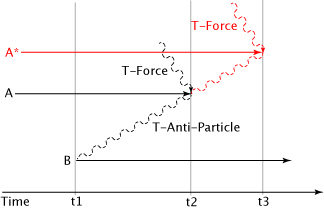 Well then the T-anti-particle would continue on its trajectory until it hit some other particle, A* at the same time as that particle is subjected to a T-force (illustrated in red). Thus changes in A do not affect event in the past, but rather effect events in the future, and so there is no backwards causation, only the standard forwards causation. Of course this means that the initial appearance of B is uncaused, although such appearances may be statistically predicted. Events without causes may seem unusual to some, but it seems the right thing to say in this case, since the appearance of B cannot be predicted based on local regularities. Of course no such T-forces and T-anti-particles exist in our universe, to the best of my knowledge; my point here is to show that backwards causation is unnecessary, and problematic, even in principle. Final Note: I have had to qualify some of what I have had to say here by restricting it to universes with one time dimension. In universes with two or more time dimensions we still don’t need backwards causation, but causation is a much more complicated affair. In brief you can always pick some time dimension as the causal one, and give causal explanations in terms of how events develop along that time dimension without invoking backwards causation, assuming causal effects are local and don’t propagate instantaneously.